I got really giddy when I saw these phenomenal laced shoes by Balenciaga. 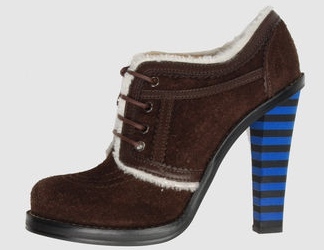 Ever had striped heels? 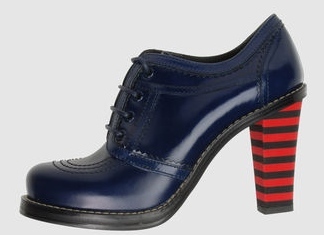 The stripes on the heel work quite well with the overall design of the shoe. Kind of retro and a hint of preppiness. 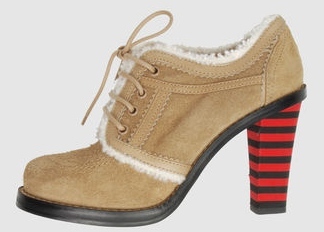 The sturdy heel makes it comfy for you to walk in. I prefer the dark brown ones since I’m more attracted to suede in fall/winter seasons. Love the fur trim… so cozy! A perfect pair of shoes for day time to night time. The kind of shoe that you won’t ever want to take off!